Well, it is hard to tell, in black and white, that the little bird is a golden-crowned kinglet, but that is what it is. I have big dreams of painting it in colour some day, but I thought it would be fun to do a pencil drawing first. I used 140 lb cold press paper, a neat experiment which I’m not likely to repeat. I didn’t like all those bumps under my pencil! Another experiment, which I will repeat, was using pencils with different grades of graphite softness. 4B makes great darks! 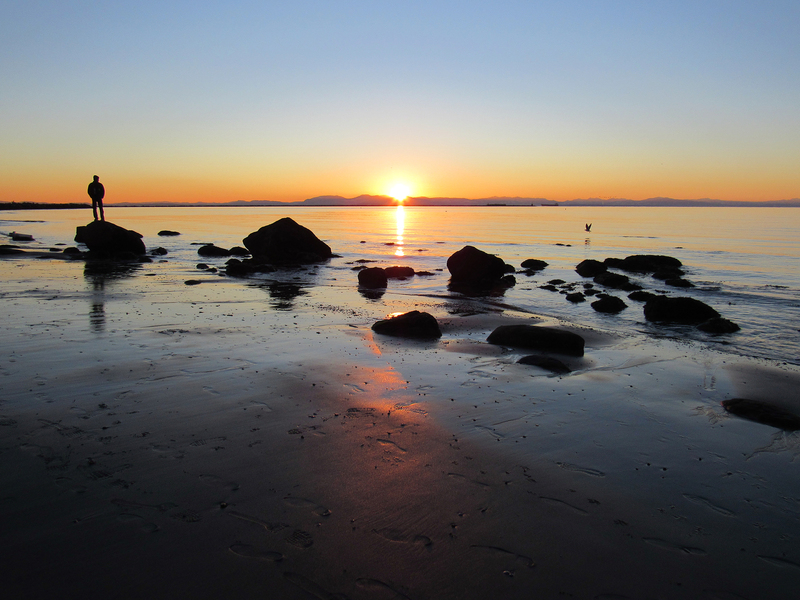 The reference was a photo I took on January 3rd while walking with my sister at Wreck Beach. 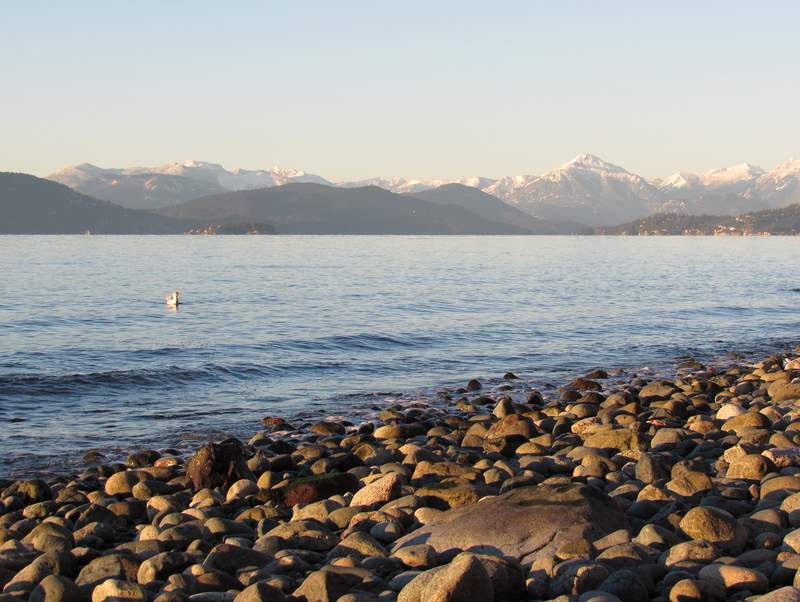 Vancouver had an unusually cold winter this year – lots of snow and sub-zero temperatures – but it was still wonderful to be on the beach on a sunny day. OMG! The drawing is stunning! Frame that! The selfie is cute. Nice to see you! I LOVE your sunset image. Great silhouette and composition. The reflected light on the beach is gorgeous. I’ve never liked drawing on rough paper, no matter the medium. All of those little gaps make me want to fill them in. This is good though, with good detail. What a detailed work Myriam! Very nice! 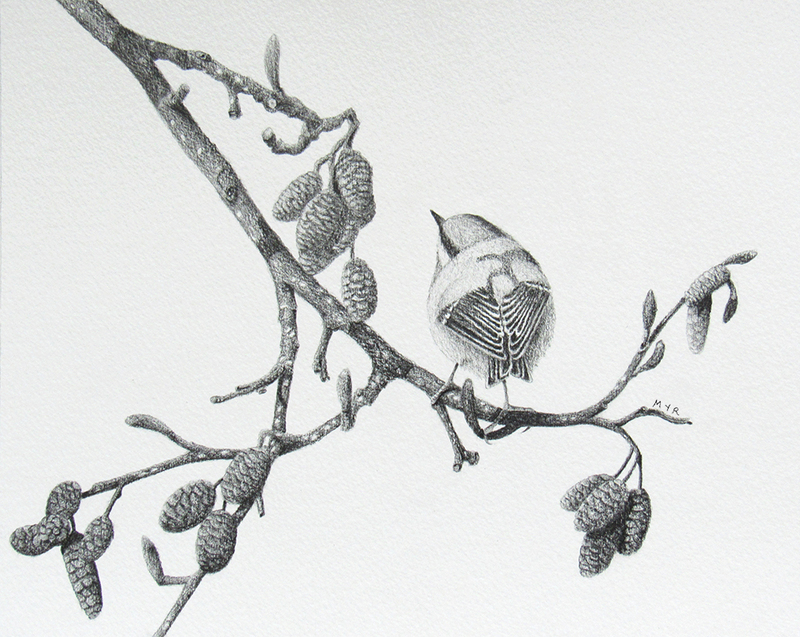 The little Kinglet bird is an excellent graphite drawing! 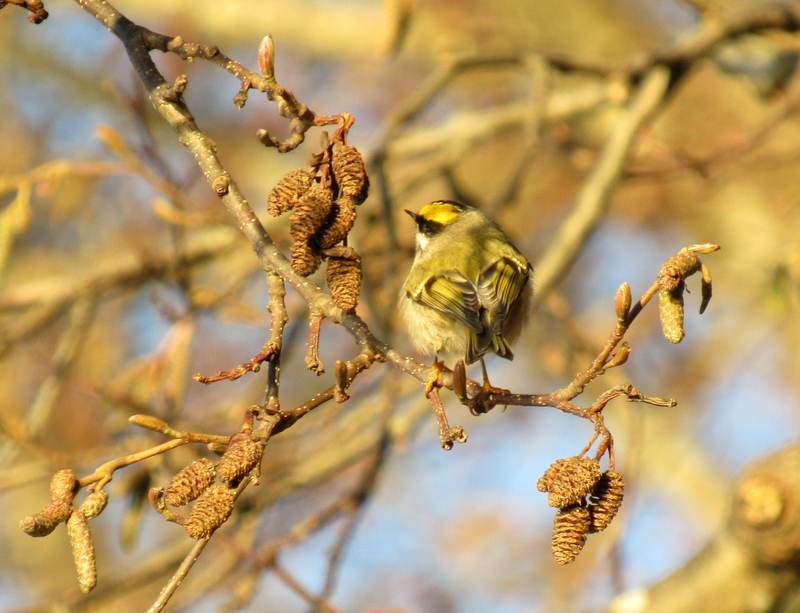 The sweet little bird is definitely a Kinglet with its tail markings well marked and the golden crown on its head. Kinglets are one of my favorite birds that appear in the fall. I have seen and heard them in the forest and along the road collecting the seeds after a wind storm. They appear not to be bothered by me when I walk within a foot from where they are located on the road. They seem to be unaware of danger; once in a while I will see a dead Kinglet on the road after being hit by a car. Thanks for your lovely compliment, Lois! 🙂 It sounds like you live near kinglet heaven… a beautiful place to imagine. Too bad about the occasional car danger. How lovely! A marvellous drawing. Definitely agree with you with 4B! This is an amazing graphite drawing. It deserves to be framed. Thanks so much, Shannon! 🙂 Birds and smiling people on a sunny day make lovely memories. Those pictures tell the story of a wonderful afternoon! Love your drawing, I´m impressed by all the detail. Beautiful! :-D! Yeah, sometimes I like to walk on the beach with just binoculars and a fanny pack (j.k.). Thanks for your awesome compliments! Your recent drawing of the dog and toddler is adorable. It is so cool that you can draw from your imagination! I know what you mean about the too-tight stuff for kid-lit. Kid-lit illustrations all tend to have a whimsical, imaginative quality. I’ve been trying to draw a fox lately (funny how hard it is to draw a facial landscape I’m totally unfamiliar with!) and foxes show up a lot in kid-lit, but none look like foxes exactly, but they are all clearly foxes and all have their own wonderful aesthetic quality. There’s so much joy in this post. Golden-craowned Kinglets are so cute, I love them….love the firmness of your tiny cones and branch bark…the sunset – wow….and happy faces. Thanks for your lovely comment, Lynn! 🙂 I usually focus of photographing birds and forget to photograph humans. Luckily, my sister likes to remember good times with selfies. Human smiles are quite marvellous! I so enjoyed this post, Myriam. I liked hearing about your brisk walk, seeing you with your sister, beautiful photos of your walk. And your artwork is truly fantastic. I liked seeing the kinglet model, and I really loved seeing the photo you skillfully created from the photo. Fantastic drawing! Thank you so much for your lovely words, Jet! 🙂 I’m glad you enjoyed the drawing and the word-and-photo story behind it. I must admit that last time when I saw the post I was hurry and only looked pictures. And I really thought that the first picture is also photo, some kind of black and white photo with some cool filter. Thank goodness, I came back to read it properly and to discover that it’s really your drawing. Now I notice that there are no such blurry background like in other picture, but still…I don’t know enough words to express how good it is. Just WOW, Myriam! Thank you so much for the spectacular compliment, Hanna! 🙂 I had a bit of trouble finding the patience to draw all those cones, but I managed to convince myself that they were as important as the bird. So I learned to draw something new! I found the perspective for the cones that didn’t point straight down difficult, so one day I want to practice drawing real, 3-D cones from different angles. it is so much fun to see your wonderful drawings! Black and white (and either sketches) are my favourites i guess. Even if i like watercolor a lot ! This one is great 🙂 nice details. I can feel the fragility and the ephemeraliry that emerge from the scene. Le papier n’était peut-être pas agréable pour dessiner mais le rendu est top ! ça a un côté vintage très sympa je trouve ! 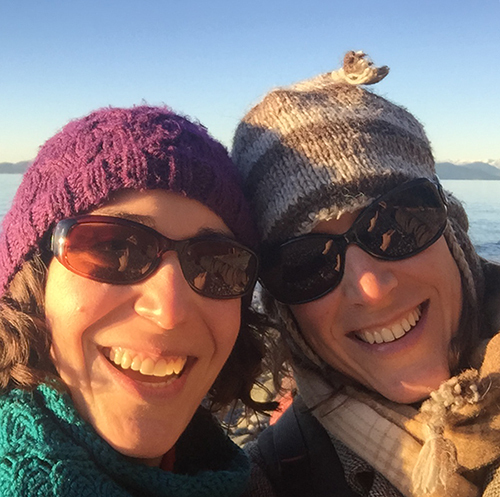 Bravo Myriam et merci pour le partage ! Wow! Thanks for the amazing compliment, Melissa :-). Alas, I only drew one and I gave it to my sister.